MAKE ME UP (PART 1) - I Blog, Therefore I Am. One of the best and most difficult wedding suppliers to find is the hair and make-up artist. I never thought that I would totally obsess over finding "the one" who will make me look good and fresh come wedding day. As most of you know - I am not the girly girl. I don't wear make-up on a daily basis save for some powder and dash of lipstick. Thanks to bridal fairs, the GirlTalk Forum, W@W and Instagram for providing the best resource for anything bridal make-up related. I prefer nudes, earthy and browns on a daily basis but would like to achieve something sweet and nice for my bridal look without overdosing on pinks and peaches. I had five (5) trial make-ups so far from various make-up artists. I took advantage of the bridal fair free trials but invested on a couple of artists on my shortlist. I made reviews and listed on this post the looks they created for me to help fellow brides in their quest for "the one". I am not really after big names and I am willing to get a not-so popular stylist as long as she/he makes me look good. My wedding look 'brief' to the make-up artists is to just notch up a bit my features without transforming me. The last thing I want is an overwhelmed-who-are-you reaction from Witt when he sees me at the altar. 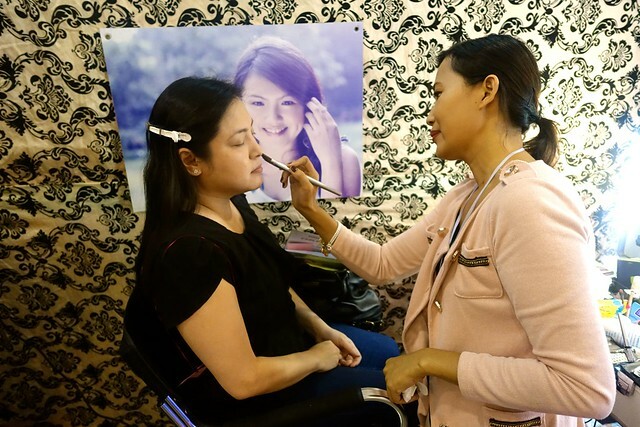 Malou Hibaler is one of the make up artists who participated at the Weddings & Beyond Bridal Fair last January 11 at the PICC Forum. 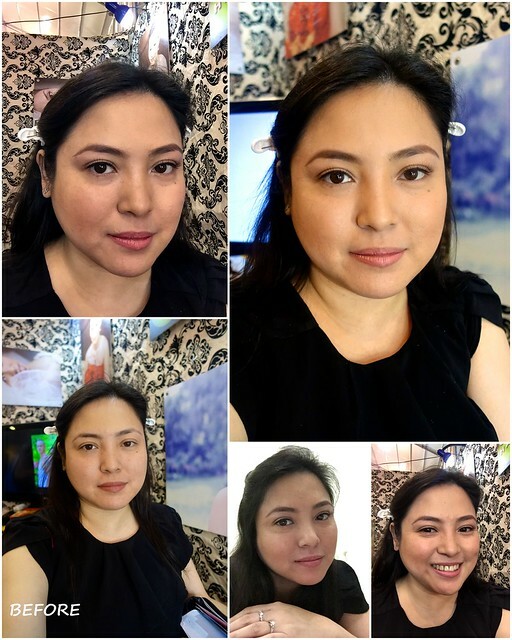 A quick Google search said that Malou is an accountant-turned-make-up artist who used to work for the best and biggest telecommunications company in the Philippines (small world - but I am not privy to this when I met her). Malou took a make-up & hair styling course at the Center for Aesthetic Studies after her Smart gig. I got fascinated with her portfolio on display so I asked for a trial at the fair. It was also my first time to have airbrush make-up. Malou used make-up brands like Mac, Urban Decay Naked, and Make-up Forever. She is very nice and she asked me what kind of look I want for my wedding. She put on what I liked and even accommodated my anti-pink/peach lipstick request. She even told me that I had an edgy feel when it comes to make-up. The whole make-up feels light. Malou made me up for less than 40 minutes but it feels very complete (with false eyelashes to boot). She also contoured my face very well. The look she gave me was very soft and it blended well with my skin hours after. There were no hair styling offered but the look will be very suited for a half-ponytail. She suggested that I get highlights for my hair so that it would look better in photos (I super agree). My 'Before' photo looks almost the same as my 'After' photos at first glance. The eyebrows are nice and the archs were perfectly lined. I specifically asked Malou to veer away from reddish eyebrow liner thus she blended it. My sis-in-law/Matron of Honor also approved the look. The center photo at the second row was taken at home and 3 hours after the make-up was applied. The photo appeared to be lighter after I uploaded it compared to how it really looks. All packages has grooming for the Groom, add P2,000 for airbrush & P1,500 for additional head. Out of town fee to Nuvali is P2,000. Bridal Fair Promo: Free upgrade to airbrush, free hair & traditional make-up for 1 head. Malou will participate again at the Weddings & Debuts Bridal Fair 2015 at SM Megamall on February 20 - 22, 2015. You might want to meet her, inquire, and get a free trial. For someone who's been around for quite a while - I am wondering why Michael Celestino is not popular in the wedding blogs and forums I go to. He is into wedding fairs and I always see his booths in the last 3 fairs I attended. He is a long time make-up artists to celebrities in GMA so maybe that's also the reason why he is not wedding mainstream yet since he specializes on celebrity looks. 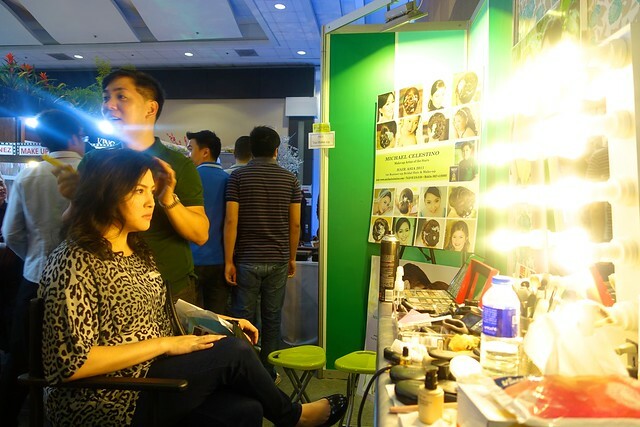 I was able to have my trial make-up with him at The Getting Married bridal fair last February 17 at SMX. Michael was the only one who used traditional make-up on me for my trial. I must say that traditional make-up is still worth considering despite the growing popularity of AirBrush. Just make sure that the artist is good in blending. Michael used a lot of good brands for make-up. I wasn't able to take note of it all but I love the Mac Faux (Satin) lipstick that he applied on me. I am not just sure if it's the most appropriate lipstick for the bridal look but it's definitely more than okay for daily jaunts. I'll get a tube soon! There were a lot people who asked for trial make-up from him in the fair. I suggest that you schedule an exclusive make-up trial with him if you would like to try or book him. He is the best in hair styling (technique-wise) among the artists I had trials with. Michael cleverly used yellow lights on his booth so the make-up looks he did were very flattering. The make-up is very simple and it doesn't scream "bride". I asked for a no-fuss earthy-brown look so that's what exactly I got. The eyebrows are nice considering that he did not spend too much time on it. He did some plucking and tweezing which I don't normally like (because I have my trusty Browhaus for that). BUT he cleared the edges which Browhaus doesn't want to touch so the result was really nice. Traditional and AirBrush make-up doesn't differs when it comes to hiding blemishes and bumps. Michael is good in concealing eyebags. He highlighted with powder the area under my eyes as finishing and it hid the eyebags cleverly. This is super points for him so consider him if you your main make-up priority is to hide nasty dark circles. He is good in hair styling but the one he did for me has a rounded top so it made me look fatter. I am not particular with the hair (yet) so I am not too bothered with this. My mom saw this make-up and she said that it's nice but my eyes looks smaller. All packages has grooming for the groom and AirBrush make-up is optional. The rates above are his bridal fair rates. 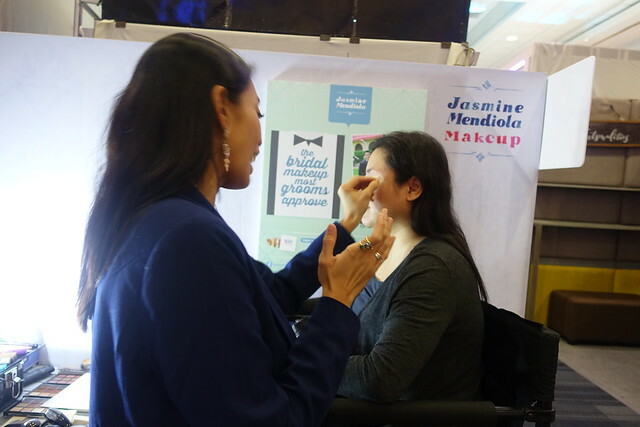 One of my must-go-to and must-inquire suppliers in the The Getting Married Bridal Fair is Jasmine Mendiola. I heard so many nice things about Jasmine and she already established herself as a very good bridal make-up artist. She is also highly recommended to me by Patty Laurel and my wedding coordinator. Jasmine was the one who did Patty's awesome make-up on her wedding to Patrick three years ago. I visited her booth on the first day of the fair and her staff gave me a schedule of her trial make-ups the following day. I chose a 6:00 pm slot and was happy that I have an excuse to go back to the fair. Jasmine Mendiola is very pretty - how make-up artists should be! She is also a friend of Patty from the Ateneo so we have some common grounds. She is also very nice and she easily makes her clients at ease with her. I love how Jasmine interviewed me before the the trial make-up session. She asked me about my skin regimen and the things I like/don't like about my face. This is super points for me since I appreciate suppliers who take their time in knowing the details about the bride so they can execute their services properly. She is also very professional, personalized and organized. She already prepared a package and contract for me in case I will sign-up in the fair. She also messaged me the morning of the trial make-up to remind me of the schedule and to give some reminders (arrive with no make-up, wear white if possible). I wasn't able to take notes of the brand of make-up she uses but I noticed that there's a lot of Happy Skin lippies. Jasmine is a very technical and professional make-up artist. She cleanses, tones and is very concerned on skin regimen before she puts on the make-up. She also explains her make-up methods every step of the way. Catch her in bridal fairs because she gives very good discounts, freebies, and gifts. She is also affiliated with Strip, Browhaus, Azta Salon, Happy Skin and Bracket. The make-up is very light. Jasmine told me that this is just for the trial and she can definitely put on more color on D-Day. 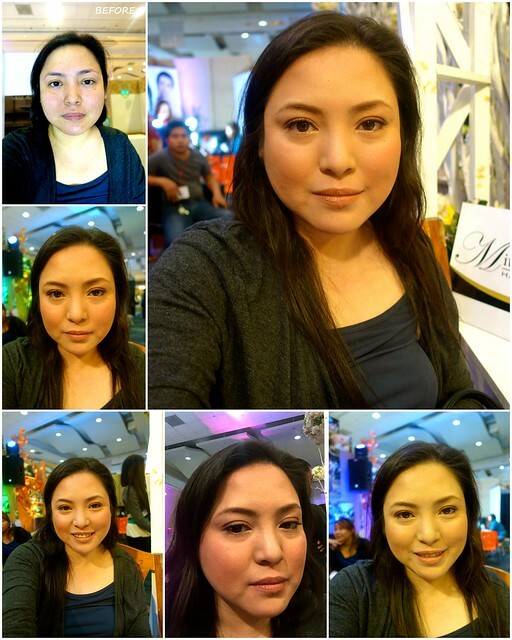 She also used AirBrush make-up on me like Malou. She followed the natural shape of my eyebrows and did not put too much make-up on it. I am actually tempted to ask Jasmine to teach me how to do it. It's very good for daily make-up and eyebrow contouring. Jasmine's expertise is the no make-up make-up look. The look and choice of colors are very consistent with each other. It also gives a very clean and finished look. 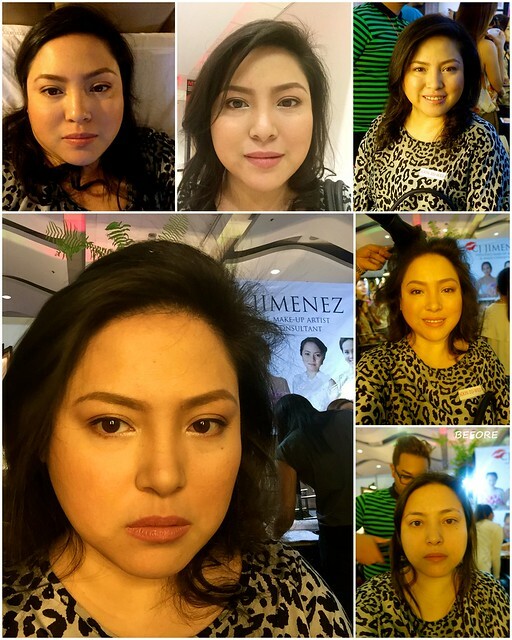 Jasmine also gave me the best coverage for my blemishes and bumps among the make-up trials I had. Royal, Renaissance and Elite also offers grooming for the Groom. Jasmine is also into wedding hostings and her hubby is a wedding videographer. I believe that she has an integrated package for all these services. The rates above are non-bridal fair rates but she gives a very good bridal fair package when you book on the spot. Malou, Michael and Jasmine has additional rates and packages (pre-nup, styling, etc.) which I wasn't able to include in the post. Just shoot me an e-mail or comment in case you're interested. Photos above were not post-processed and were taken using Sony RX100 MIII and Smart iPhone 6 with no flash. Watch out for Part 2 of this featuring my make-up test review of Bea Almeda and Eds Go. I like the one by Malou the best among the 3 :) It looks very natural! The one done by Michael I find too matapang for bridal look. The one of Malou has the best lighting. Among the three yung medyo ok for me is Michael's off-cam. Yeah! Wedding planning is so good! Naiinis ako I delayed it for four months. I read your wedding post as well. nakapagbook k na ng HMUA? or will you still look for other? I might book Eds Go next week na. I love my make-up when I had my trial (I have yet to post it here). Plus - she has a very good February promo and packages. If I still have the time (and the resources) I might consider three more trials: Cherry Pacheco, Pong Niu and Bambbi Fuentes. The latter will be at the fair in SM Megamall and I hope she will offer free trials. But so far medyo cool na ako with Eds. :) Will post it soon.